Digital food dehydrators have come up as the must have kitchen equipment for those who are fond of dehydrating food in the comfort of their own house. Modern dehydrators with digital displays not only look good in the kitchen but they also add a measure of accuracy to anything you are dehydrating. Old style dehydrators that used knobs and dials for changing temperature and time for dehydrating are often clunky. After a while it becomes inconvenient to change the temperature and time whenever you want to dry a new food item. With digital dehydrators, you can also program the settings to use a particular preset temperature and time when drying a specific food. 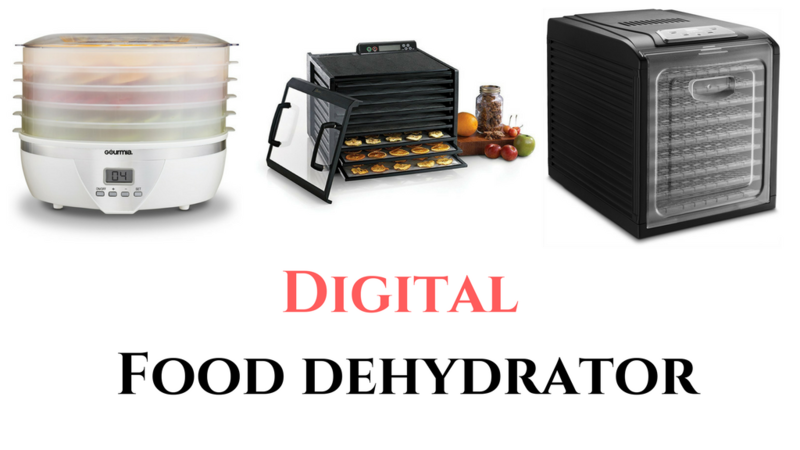 Modern digital food dehydrators are easy to set up and the digital displays make reading the units of time and temperature easy, too. With the range of digital dehydrators available in the market, it can be difficult to choose a dehydrator that meets your budget and requirements. 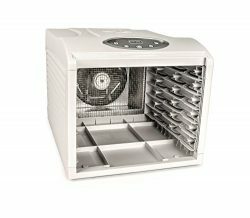 In this article, we are going to take a look at some of the best digital food dehydrator and discuss their pros and cons. The biggest advantage of using a digital dehydrator is that you can set a precise temperature and time as per the recipe that you’re using. As with knobs and dials, at times it’s difficult to choose the right temperature if the knob is loose or too tight. With a digital dehydrator, you just have to press a button and you’re good to go. No more twisting of jammed knobs or breaking off dials that are too tight. Digital dehydrators come with easy to operate controls and it’s just like setting an alarm on your phone. With dials, it can often be confusing which way is the right way to look. But with digital dehydrators, you can simply look at the display to check the time and temperature remaining in a dehydrating session. Digital dehydrators not only work well, but they also look great in any modern kitchen. As more and more kitchen equipment gets modern design, your dehydrator will also look in sync with the rest of the devices in your kitchen. The contemporary looks of the dehydrator really make them an ideal device for any kitchen. With a regular dehydrator, you are never really sure when it’s going to shut down or if it will shut down on its own. But with a digital dehydrator, you can set up a time after which the dehydrator will switch itself off and stop dehydrating the food. 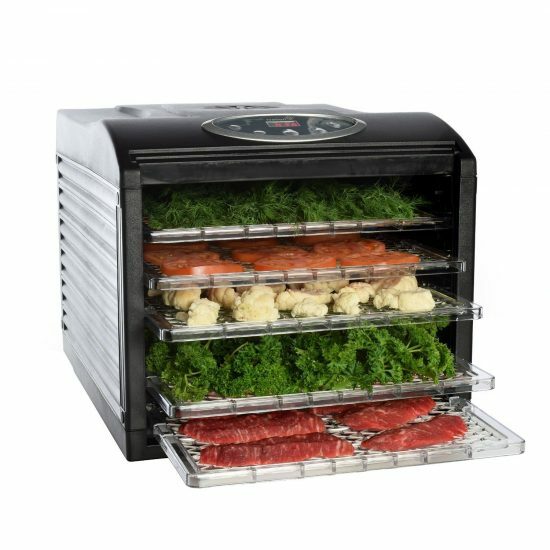 This is ideal for the times when you want to go out of house while the dehydrator is on or if you want to run the dehydrator through the night. With a digital dehydrator you get different kinds of settings that you can use for drying different kinds of foods. You can also program the time and temperature needed for drying specific foods so that you don’t need to change the settings every time. This can be really helpful if you dry fruits, meat, vegetables and more regularly. If you are looking for a dehydrator that brings innovation and performance in one package, then the Aroma 815 is the model perfect for you. The digital control is perfect for setting up just the temperature you want and you can also set up the timer for the duration you want to dry the food for. The unit has a plastic housing with a fan in the rear and the six removable trays offer ample space for drying all kinds of food. 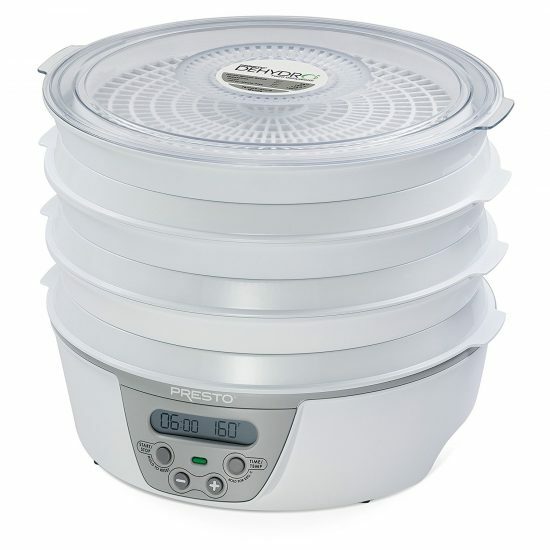 The Presto 06301 is a digital electric dehydrator that offers ample space in form of six trays that you can use for drying all kinds of foods. This dehydrator is made from high quality materials that will last you for years with proper care and upkeep. The unit also comes with a digital thermostat and timer that allow exact timings and temperature as mentioned in the recipe that you are following. 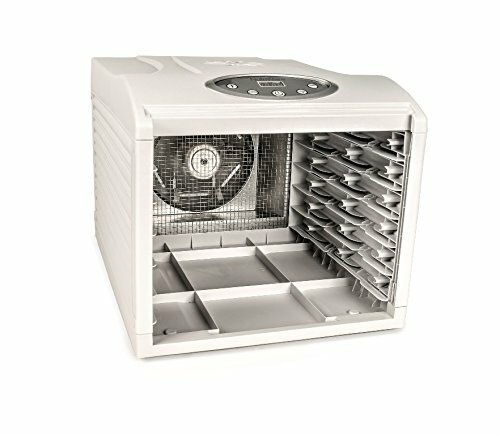 The dehydrator comes with a bottom mounted fan that evenly distributes air through all the trays making drying quick and efficient. What’s more, you can even increase the capacity of the dehydrator by adding six extra drying trays as and when you need it. 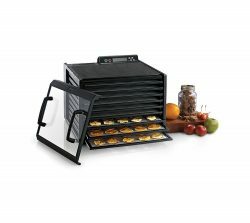 This digital food dehydrator has ample features that will please seasoned dehydrating enthusiasts and also come up to the expectations of the novice users. The unit offers an amazing capacity of up to 9 trays so that you can dry large batches of food with ease. The dehydrator has precise control elements so that you can set the exact temperature for your recipe. With the micro-mesh trays there is no need to rotate the trays either as the air circulates easily through the trays. 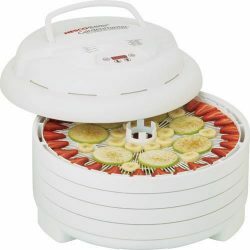 This is the ideal dehydrator you need when you want to dry large quantities of food with ease. 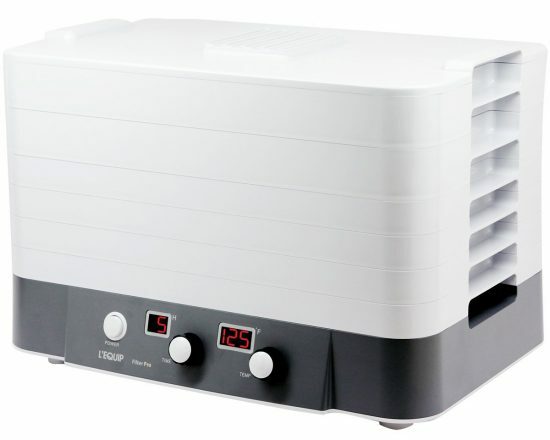 If you’re looking for a large sized dehydrator that offers a powerful drying experience, then look no further than the Ivation 400W electric food dehydrator pro. This dehydrator is designed to offer a large number drying options to customers. The digital display makes the device easy to use as you can set the temperature and time as per the recipe you are following. You can also view the progress of dehydration through the clear plastic door of the dehydrator. 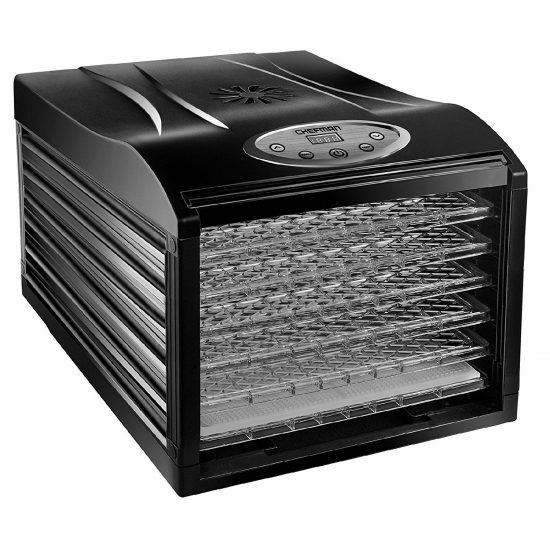 The dehydrator offers 400 watts of power with a rear mounted fan for equal drying. The Nesco FD1040 Gardenmaster Dehydrator comes with a programmable timer that allows you to set the time you need the dehydrator to dry the foods. You get 1000 watts of drying power so that you can dry food quickly and efficiently. The unit also comes with a converga-flow air flow technology that moves the air in such a manner that all trays get an equal amount of heat and there is no need to rotate the trays. You can also use the inbuilt dial to adjust the temperature as per your recipe’s requirements. In case you want to dry more food at a later stage, you can add up to 20 trays to this dehydrator. The Excalibur 3948CDB is a 9 tray food dehydrator that offers excellent drying abilities and a range of useful features too. The unit has ample drying abilities and with 15 square feet of drying space, you can dry all kinds of foods in this dehydrator with ease. You can also adjust the temperature as you’d like and the timer feature on this dehydrator shuts off the unit once the time if over. The square shape of the dehydrator also makes it easy to place it on the kitchen shelf or store it away. 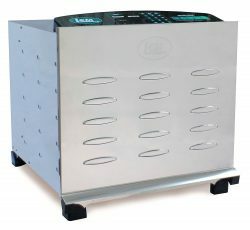 LEM 1154 Stainless Steel dehydrator is a highly durable unit that is made of stainless steel. The digital control panel makes it easy to control the time and temperature needed for drying the food quickly. The unit also comes with 3 quick set buttons that allow you to save the settings needed for drying specific foods. The dehydrator also has ten chrome plated trays that offer up to 16 feet of drying area. The fan and heating element at located at the back of the dehydrator offering quick and efficient dehydration. 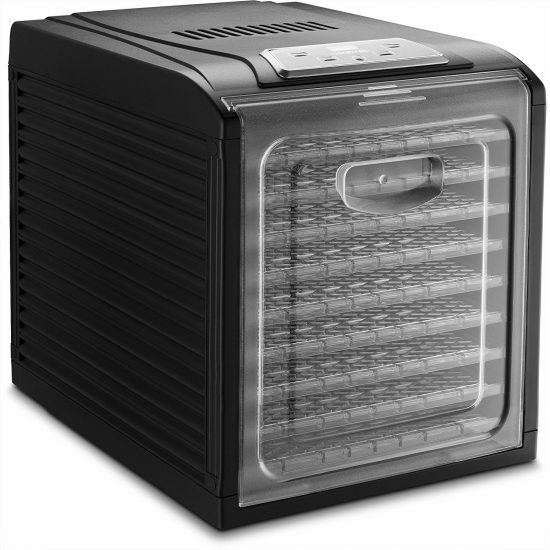 L’Equip FilterPro Food Dehydrator is a solid dehydrator with a filtered air system that dries the food with clean air, keeping it free of any contaminants. The unit comes with six trays and you can also add more trays, taking the total up to 15 trays. The spacious trays are ideal for drying all kinds of foods, from fruits and vegetables, to meats, nuts and more. 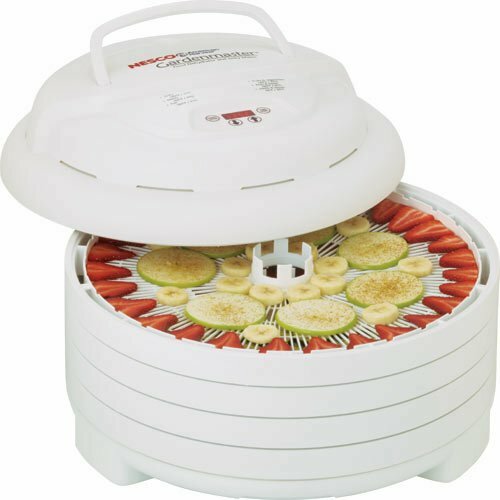 The powerful dehydrator offers 530 watts of drying power for dehydrating all kinds of foods. The GFD1550 Dehydrator is a small and powerful unit that contains five trays that are ideal for drying all kinds of foods. The timer can work up to 36 hours for longer drying sessions. The digital temperature setting is perfect for drying food at the precise time and temperature according to the recipe you choose. The trays nest into each other when not in use so that you can save space on your kitchen counter. 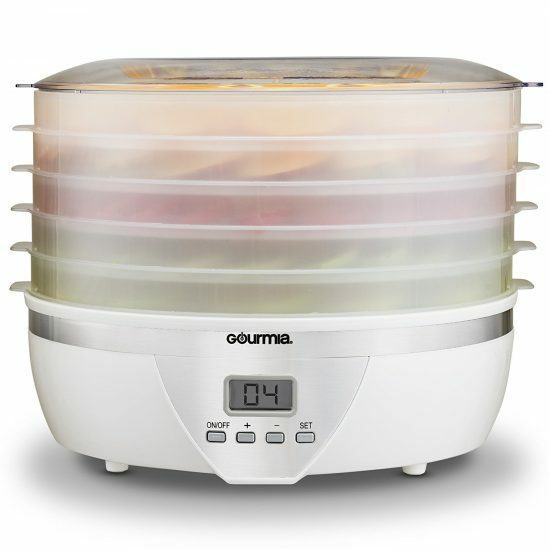 Whether you’re drying jerky or dehydrating fruits, this is the ideal dehydrator for all these purposes. When you need drying space, Chefman food dehydrator is the model you should be looking at. The unit comes with 6 spacious trays, each offering 13”x12” of space that you can use to dry all kinds of foods. The operations of this dehydrator are simple and you can easily set the time and temperature needed according to your recipe. The door of this dehydrator is also transparent so that you can observe the progress of dehydration of food. The dehydrator is designed in a way to efficiently dry food without overheating it. Customers often have questions and queries about dehydrators and here are some of the frequently asked questions about digital dehydrators. Q1) How can I set up the drying time on my dehydrator? Ans. 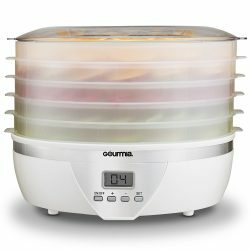 Most dehydrators have + and - buttons that allow you to set up the time. You can also look for buttons market up and down. If you can’t find these buttons, look for the manual of your dehydrator and you will definitely find the guide for setting up the temperature there. Q2) How can I make sure my dehydrator switches off once the drying time is over? Ans. You can check in the manual of your dehydrator to see the settings for timer and more. Once you set up the timer for a certain duration, it will countdown backwards till the drying time is over. Q3) The display of my dehydrator is not showing any numbers, what could be the reason for this? Ans. Your dehydrator panel might have malfunctioned and you might need to reset it. Check the manual of your dehydrator or contact your dehydrator manufacturer to find the reset procedure for your dehydrator model. Q4) I was cleaning my dehydrator and some water got into the display panel and now the display panel isn't working. How can I remedy this? Ans. You can let the dehydrator rest for a while without plugging it in. If the water doesn't evaporate, you might need to take the unit to a service center to get it checked. Q5) The timer feature of my dehydrator only goes till a certain limt. How can I dry the food for a longer time period? Ans. You will need to keep a check once the timer gets over, then you can rest the timer for another set of hours as mentioned in your recipe. Q6) I have cut some fruit for drying, but there is not enough space between the sheets of my dehydrator to put the fruits in. What are my options? Ans. You can try slicing the fruits thinner if your dehydrator trays stack on top of each other. If you have a box shaped dehydrator that takes tray inserts, you can skip one tray and place fruit on every alternate tray. Q7) The trays of my dehydrator have a sticky residue on them after I dried fruits. How can I get this residue off? Ans. Soak the trays in a solution of soap and warm water for the night and in the morning use a small brush to scrape away the residue. 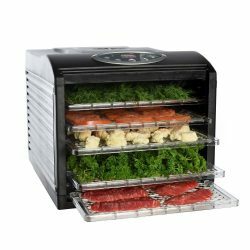 You can read How to Keep Food from Sticking to Dehydrator Trays and Best Way To Clean Dehydrator Trays for more info. Q8) My dehydrator is making a strange noise from the fan area. What could be the reason behind it? Ans. There is probably some part loose near the fan assembly that needs to be fixed. You can also check if the trays are in place properly and the unit is placed on a stable surface that doesn’t move much when the dehydrator is on. You should consider taking your dehydrator to an authorized service station, too. Q9) I cannot find the warranty information for my dehydrator in the literature that I got with it. Where can I find this information? Ans. You can look up the manufacturer of your dehydrator and check the website to find the information you need. A digital food dehydrator can make drying food much easier for you. The ability to set up the time and temperature clearly and precisely makes these units a must have in any kitchen. You can also set up the dehydrator to switch off once the timer is over and some models even allow you to save the settings so that you don’t have to change them again and again. If you’re in the market for a new dehydrator, then a digital dehydrator is the way to go. It will look great in your kitchen and also allow you to dry all the delicious foods that you want for your family. Hi there, I’m Linda, chief editor at Dehydrator Blog. We believe in Health is wealth. After struggling to buy healthy organic food for my family, I decided that’s not the right way to do. Still today many of them not aware of food dehydrators and uses of dehydrated food. That’s why my team and I want to solve this problem. That’s how Dehydrator Blog was born.. Our mission is simple. Trying to spread awareness of dehydrator to all. Join our hands if you believe in our mission. DehydratorBlog is a participant in the Amazon Services LLC Associates Program, an affiliate advertising program designed to provide a means for website owners to earn advertising fees by advertising and linking to amazon.com, endless.com, smallparts.com, myhabit.com, and any other website that may be affiliated with Amazon Service LLC Associates Program.